When she was young, Qiu Jin fantasized about becoming an heroic figure in China. She studied female historical personalities and aspired to emulate them in her own way. Unfortunately, the Chinese society that Qiu Jin was born into conflicted with her ideals about women. But Qiu would not let her spirit, her ambitions or her feet be bound, which ultimately cost her her life. 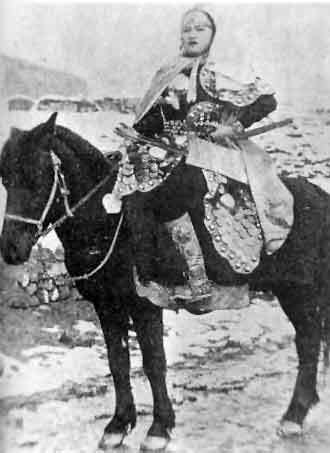 Being raised in a wealthy family gave Qiu an opportunity to be educated, and while her parents expected her to fulfill her destiny as a woman by becoming a wife and mother, they allowed her some leeway to express her individuality by doing things like sword fighting and riding horses. STUCK IN TRADITION When she was 19, Qiu’s father arranged for her to marry Wang Tingjun, the son of a wealthy merchant, who was much older. She acquiesced and the couple had a son and a daughter. Wang thought he was marrying a traditional girl, and he expected Qiu to behave as one, but Qiu couldn’t stand the confines of the relationship. The children brought her little comfort, and she felt lonely and depressed. Qiu found her emotional outlet through writing poetry. After she married, the themes of her verses shifted from nature, women’s activities and historical heroines to expressing loneliness and deep disappointment in her marriage. She missed her birth family and wrote longingly about the past. In 1898 the Boxer Rebellion broke out gainst the occupation of foreigners and spread of Christianity in China. Two years later, The Boxers, also known as the Righteous and Harmonious Society Movement, attacked the foreign embassies in Peking. This reignited in Qiu the ambition to serve her country and do something great. Being bound in a conventional marriage was an obstacle to her following her passion, but not a deterrent. FOLLOWING HER PASSION When she was 28, Qiu left her family behind to go to Japan to study. She started wearing pants like men in the West and openly advocated for more rights for women. She established a newspaper and used her writing as a platform to denounce foot binding and other practices that subjugated women and to support overthrowing the Chinese government. When Qiu returned to China in 1906, she started a feminist newspaper called Chinese Women which encouraged women to train for work in various professions to become financially independent. The following year she became the principle of the Shaoxing Datong Sports Teachers School. On the surface, it was a school for elementary school physical education teachers, but it was actually a place to train military leaders for the revolution. Qiu and her cousin, Hsu His-lin, worked together to unify the various secret revolutionary groups to effectively overthrow the Manchu government. 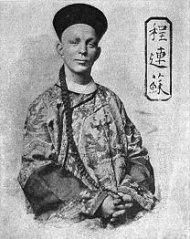 In July 6, 1907, Hsu was betrayed by a traitor among his fellow rebels. During interrogation he confessed his affiliation and was executed. About a week later Qiu was also arrested, but she denied any involvement in the rebellion. The authorities found incriminating documents, however, and she was immediately beheaded. Six months after her death, two of Qiu’s friends arranged for a proper burial. Qiu’s memorial service turned into a public protest. The government had not become any more sympathetic to Qiu, and within a year, her tomb was razed. Qiu’s two caring friends ended up being wanted by the government for their association with her. QUESTION: What was the most helpful or honorable thing you’ve ever done for a friend? Ashby, Ruth and Ohrn, Deborah Gore, editors, Herstory: Women Who Changed the World. New York, N.Y.: Viking, 1995. Qiu Jin profile by Lynn Reese.